Whenever Apple releases its latest ‘next big thing’, it tends to find its way into the tech news spectrum on a daily basis, and Siri – bundled with iOS 5 for early adopters of the iPhone 4S – has proved to be no exception. Of course, not everyone has kindly warmed to the idea of having a virtual secretary to cut the corners here and there, but the majority of iPhone 4S users and technology enthusiasts have enjoyed witnessing its current catalogue of capabilities, along with various insights as to what could be in store for the future. 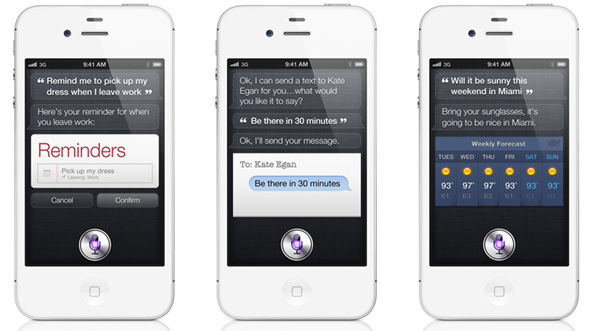 Hitherto, there have been various ports to older devices, a dubious, yet faintly plausible and definitely captivating mind-to-Siri project, along with Applidium’s protocol hack, which opens the door iPhone’s impression of Cortana to be adapted through 3rd party apps, as well as potentially Android-based devices. CollegeHumor, a site dedicated to silly-yet-funny videos aimed at teens and young adults, has pieced together a rather entertaining parody video in which a husband and wife are seen arguing via Siri, who tries and fails to act as a mediator – resulting in two broken iPhones. While the video provides one of the better ways to kill a minute or two on the Web, it does also raise a few rather more meaningful points regarding Siri. With Apple apparently looking to update Siri’s intelligence capacity at regular intervals, could there ever be a situation whereby Siri detects such animosity and, instead of being a cooperative slave, respond in a manner which suits your perceived ‘best interests’? One suspects that being given advice from binary is not exactly the best way to calm somebody down, but we’ve all been in situations where we send messages which we perhaps didn’t mean, and would have said things differently in hindsight – or with a little whisper in our ears from Siri. Siri is only one month old, and when you look at the various day-to-day applications available, integrating the voice recognition into them makes for an exciting forecast. Maps, games, navigation – the list is endless, and although the technology itself has been around for a while (as the skeptics like to continually highlight), Siri looks set to be another iconic entry to Apple’s list of era-defining products.